The view from the fairway of the par four 1st hole sets a representative tone for the day at The Wolf. 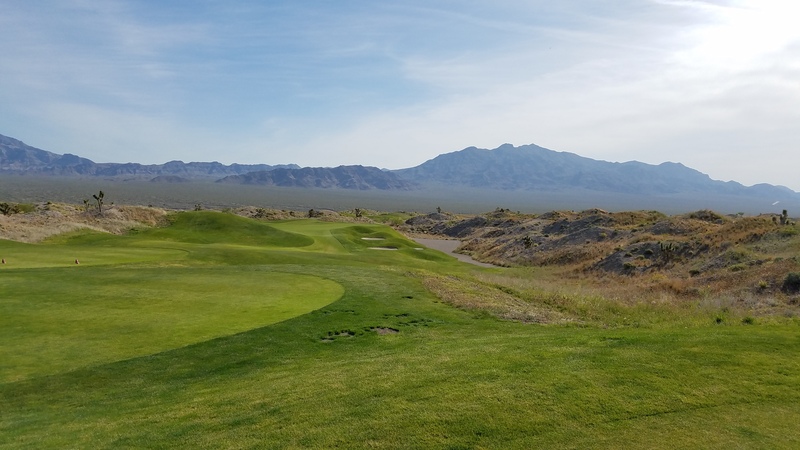 It took two trips to Las Vegas to finally round out my Paiute Resort triple play, but after playing the Wolf Course, I was perfectly content that I had saved the best for last. 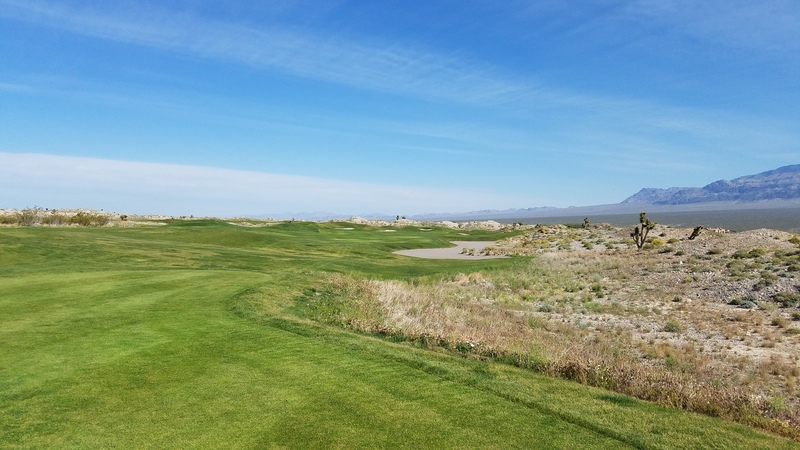 Like its Sun Mountain and Snow Mountain brethren, the Wolf is a Pete Dye design that opened for play in 2001, making it the newest course at the Paiute Resort. From the “Championship” tees, the course stretches to an almost laughable 7,604 yards with a course rating and slope of 75.5/145. 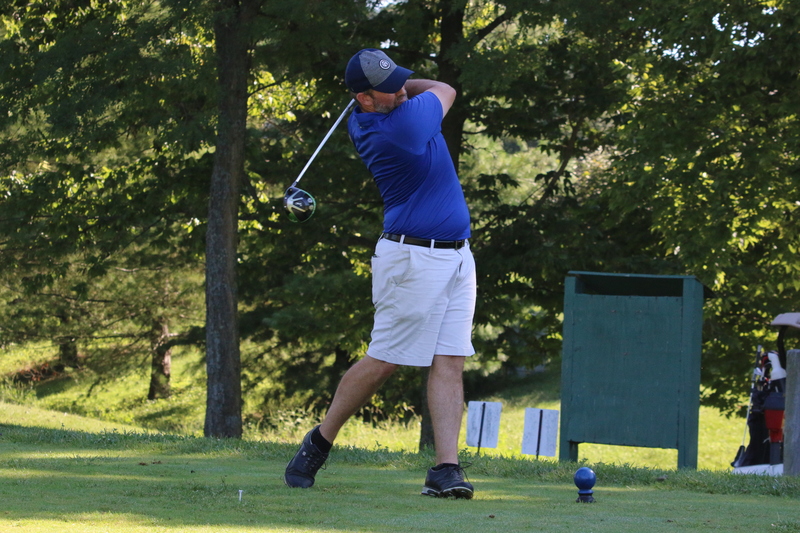 However, two tee boxes up, at the Yellow tees, the course plays to a much more entertaining 6,483 yards with a course rating and slope of 70.7/126. 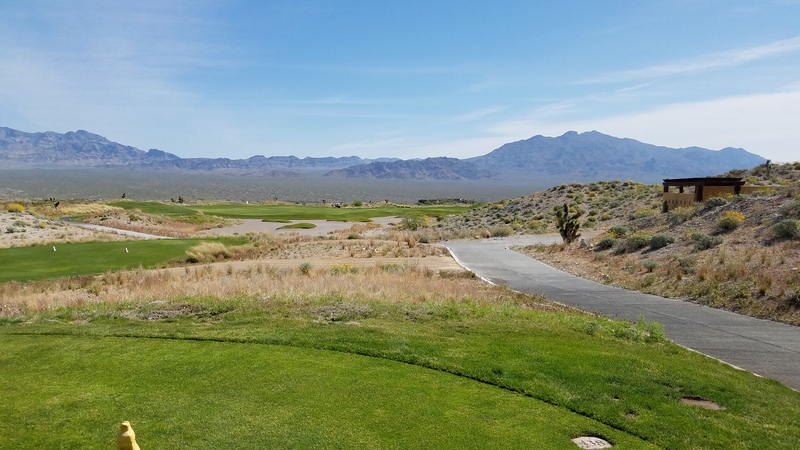 On our particular cool, windy desert morning, this intermediate tee box proved the correct selection for the first time playing the course, presenting a round filled with equal parts fun and challenge. From the 2nd fairway, one gets a view of the competing rolling mounds of the fairway, rough, and native areas. At its heart, the Wolf desperately wants to be a links golf course. 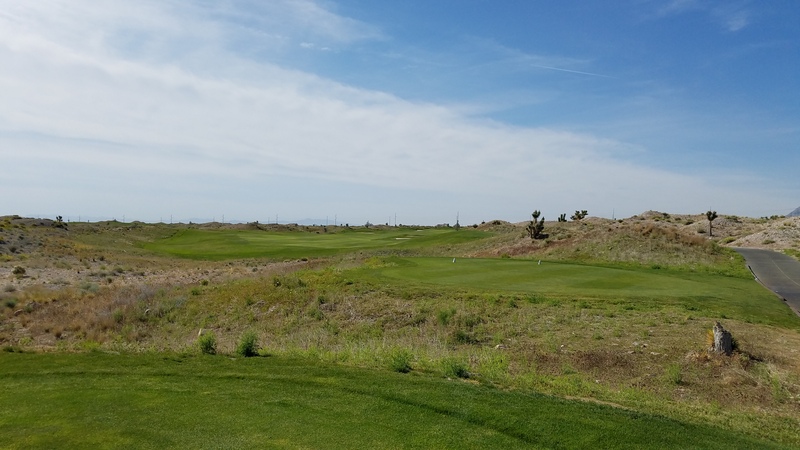 Instead of coastal dunes formations framing the fairways, the Wolf contains huge, high rock outcroppings and native scrub grasses that frame the playing surfaces, along with high-banked mounds that separated the desert from the course. These were not natural earthen formations, but to Dye’s credit, they were skillfully shaped to look very natural and not out of place. The mounding and contouring of each hole also effectively isolates almost every hole, so that each hole is an experience unto itself without the bother and distraction of golfers simultaneously playing other holes (or even the other courses or clubhouse, which are practically imperceptible from The Wolf). The view from the 5th tee is an example of how the Wolf is shaped to provide a visual path to the green. The combination of these framing elements and the routing creates very clean sight lines and very few blind shots or hidden hazards. On each shot, there is an obvious safe target and an equally notorious area that should be avoided. The hard dogleg right 14th hole is the only real exception to this principle, as the one cannot see the green from the tee, and, consequently is probably the only hole that would play significantly easier on a second loop around the course. 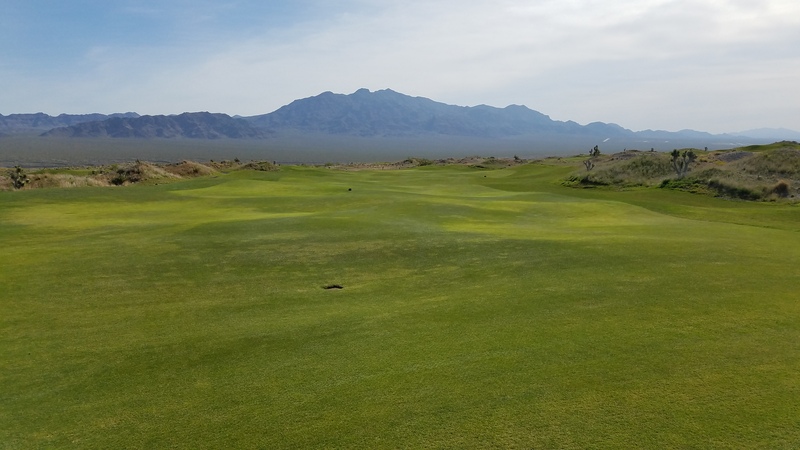 Like the other two Paiute Resort courses, the Wolf lies on the valley floor between two massive mountain formations. 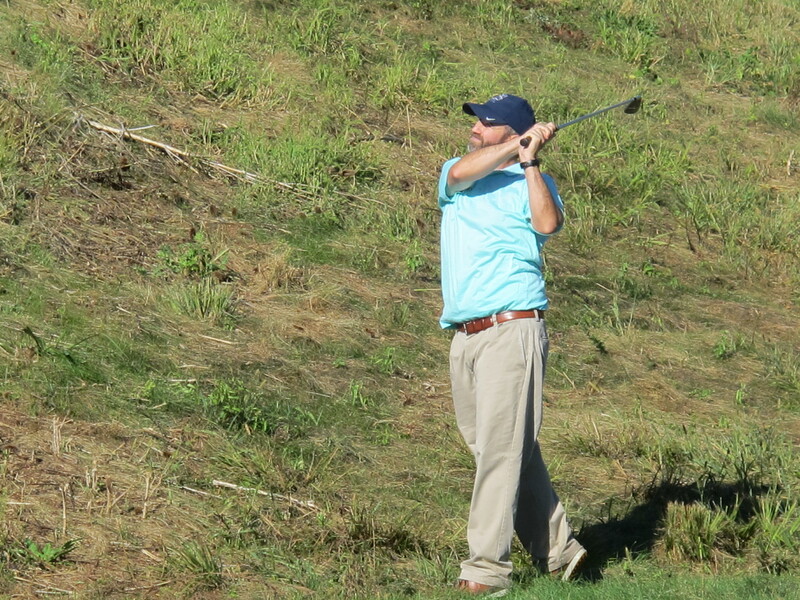 The resulting consequence is that the course falls squarely in the middle of a wind tunnel, undeterred by the aforementioned mounding and high rock walls. Look carefully at the 7th fairway. You’ll notice the entire surface is a collection of waves, rolls, and ridges. 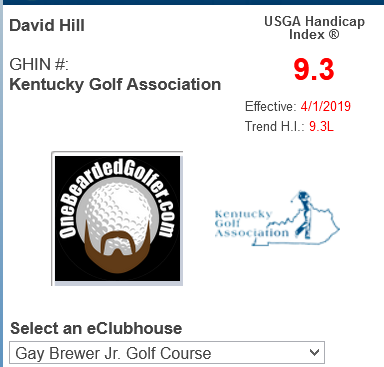 On our given Sunday morning, we got the full windblown effect, as at times, playing directly into or with the wind changed my club selection by up to 3 full clubs and was an absolute boon when teeing off with the wind at our backs. One of the subtle, but noticeable, features of the Wolf Course is that there are no flat lies anywhere on the course, except on the tee box. This is perhaps most striking in the fairways, where each of my shots from the fairway was on a slope of some kind that affected stance, lie, and, predictably, contact. Sometimes the slopes are pronounced and obvious, while in other places the contouring is more gentle, like the links rolls one may find among the dunes of a coastal links. The par 5 6th hole’s fairway combines all the essential elements of the Wolf course: rolling turf, bunkers, and a massive waste area framing and dividing the fairway. The fairway tilts don’t dominate the layout like at, say, Augusta National, but they nonetheless provide an extra layer of difficulty in attacking the predictably tough Dye greens. The micro-contours are so unpredictable from the tee or the previous shot that it could take four or five rounds of playing The Wolf to find the truly best spot and angle from which to attack the greens when accounting for the contours. In grand Pete Dye fashion, the Wolf Course includes incredibly intelligent bunkering framing the holes and greens. The course also includes effective grass hollows that prove almost equally difficult to recover as the sand bunkers. The use of large waste areas, reminiscent of those found at Harbour Town, full of firm, coarse sand and pebbles, add a layer of intimidation, skill, and strategy that simple rough or expanded native areas would lack to punish poor tee shots. The par 5 10th is a great example of a hole with a straight forward tee shot followed by a series of tough risk-reward choices with a tricky green at the end. 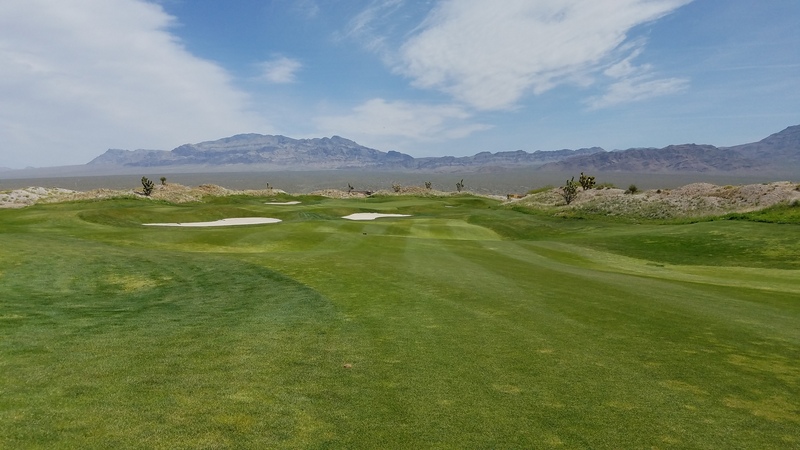 More so than most courses, the Wolf Course cleverly alternates each hole’s “decision,” the shot that embodies an individual hole’s risk versus reward calculation, between the tee shot and the second or approach shot. There is never a feeling of, “oh, great, more target golf” on successive shots. The greens on The Wolf course are very large, and uniquely and nonuniformly shaped. From an architectural and strategic perspective, this combination allows each green six distinct pin position areas, allowing for a different challenge each day of the week. 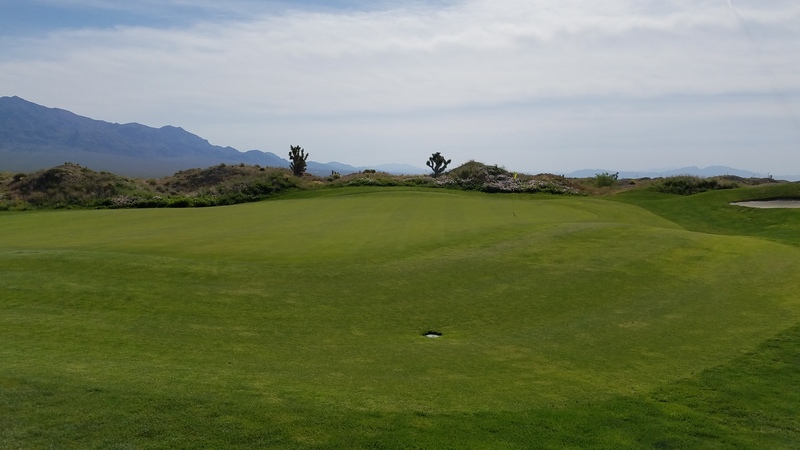 These different sections of the greens are frequently accompanied by individual bunkers, closely mown areas, or other challenges specific to each pin position that may not pose much of an obstacle if the hole is located in a different area of the green. A quick look at the surface of the 10th green demonstrates how differently the hole could play with different pin positions. 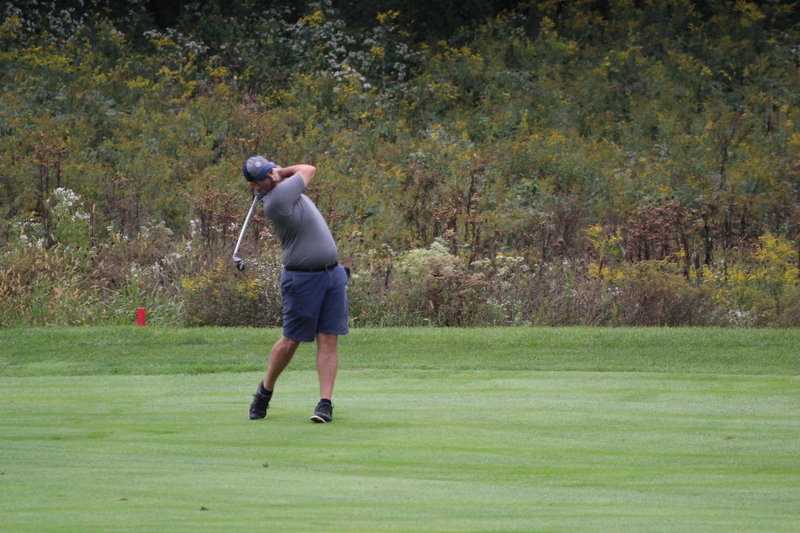 The greens at the Wolf are well-guarded by combinations of mounding, elevation, and bunkering, though each green usually has at least one avenue from which the ball could run onto the green’s surface from the fairway or approach. This option, to run the ball onto the green, though perhaps not directly towards the flag, is a key playability feature of the course in light of the strong prevailing winds. The Wolf’s diverse bunkers range from massive to tiny, and includes flat-bottomed, high-walled, and keenly placed pot bunkers (of which I was a frequent visitor). I particularly appreciated that almost all of the bunkers near the green included a high-walled face with the apex in the way of the direct route to the pin. Playing from a tiny greenside bunker at the 8th hole was one of several shots I had to play away from the pin. 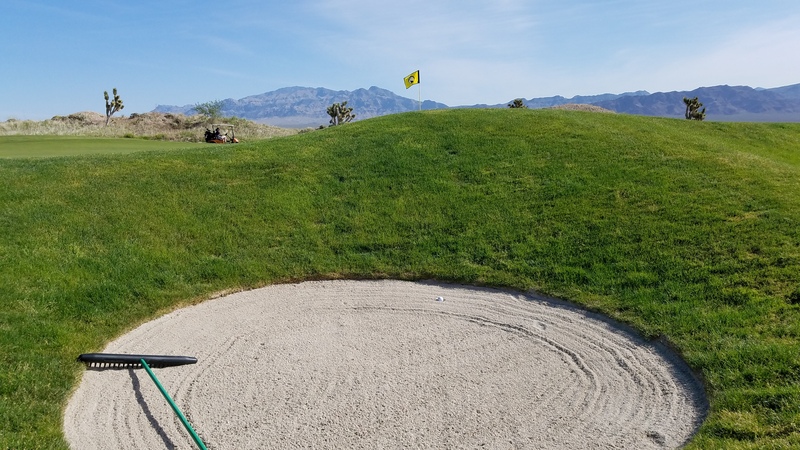 Strategically, the height and depth of the bunkers force a player to decide whether to take their medicine or go for a low-percentage, hero play, and risk facing a second, more difficult bunker shot. 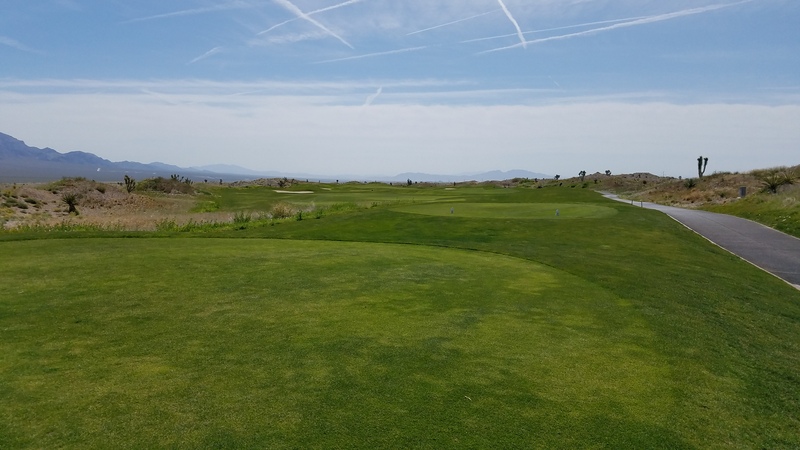 The course is laid out with careful attention given to the prevailing southeasterly wind, with no two consecutive holes traveling the same direction. In my opinion, the layout and wind combination makes the most challenging holes even more difficult. Of particular note, the 15th hole, which is a wonderful replica of the famous 17th hole at TPC Sawgrass, plays directly into the teeth of the wind. An island green, like the 15th hole at the Wolf, is a great measuring stick of ones’ ball striking and confidence…or lack thereof. 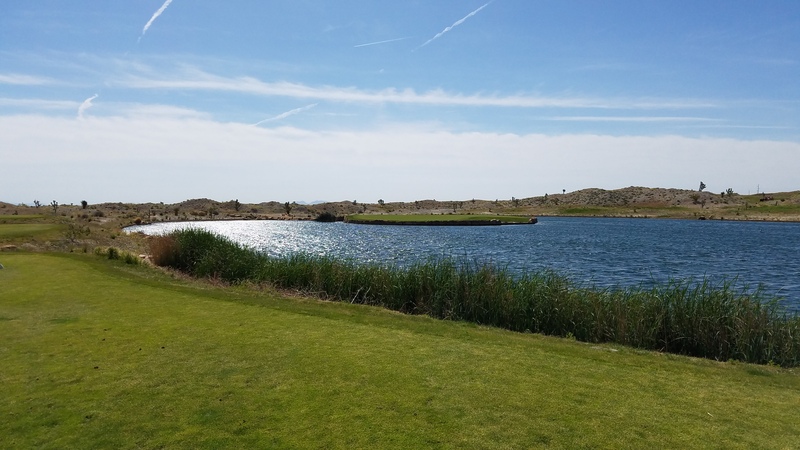 To put wind’s effect into perspective, from the 15th tee I hit my 175 yard club very well only to see it roll just long past the pin located 138 yards away and into the back bunker (which saved the ball from swimming). Another omnipresent feature on the Wolf is the sneaky amount of elevation change between the tee and green on almost every hole. With everything else that the Wolf presents visually, the changes in elevation can be almost unnoticed until one reaches the green and peers backward toward the tee. Though one of the more originally shaped Pete Dye designs I’ve played, there are plenty of familiar Dye design elements present on the The Wolf. The presentation of the par three 8th hole is so sinister from the tee. I don’t know if this template has a proper name, but it’s one of Pete Dye’s best in my opinion. These include multiple timber-framed bunkers, a Cape-hole par three over water (the 12th) that provides a great risk-reward choice. Another familiar Dye template at the Wolf is what I refer to as an “Edge of the World” par three, the 8th hole in this case, being a green laid downhill from the tee with a waste area immediately adjacent to, but several dozen feet below, the green guarding one entire side. (Different iterations of the Wolf’s 8th and 12th holes are found in my local Pete Dye-designed Kearney Hill Golf Links in Lexington). For my money, the long par four 9th hole is the best hole on the front side. This dogleg right hole, with a deep grassy hollow hugging the right side of the fairway, rewards a good drive in the middle or left side of the fairway by allowing multiple options and preferred angles of attack to the deep, two-tier, heavily bunkered green. A short, not-really-driveable par four may not set the golf architecture world on fire, but the 11th hole sure was fun to play. The green slopes from back to front, which gives one a backstop of sorts to catch what could likely be a long approach shot. This tilt of the green, combined with a wonderfully shaped approach lane between the green and fairway, gives a player the option to run the ball onto the green rather than forcing an aerial shot of considerable distance. I’m an unapologetic sucker for a good short par four hole, and the 11th at the Wolf Course is one of the better one’s I’ve seen on a Dye course. Playing predominantly downwind, at only 325 yards from the Yellow tees, one can conceivably run one up near the green if the bottleneck of bunkers and mounds narrowing the fairway can be navigated. The 14th is the only hole on the Wolf that gives very little guidance of how to play the hole from the tee because the entire green complex is hidden from view (it’s to the right). Attempting to lay back on the 11th fairway with a hybrid or iron from the tee does not guarantee par, as the large, deep green sits diagonally from the fairway approach, requiring a nervy pitch or full wedge over a massive greenside bunker to a green replete with deflective slopes and undulations. Despite the intimidating name and reputation, the Wolf is a fun course to play and can be played relatively well as long as one is consistent from the tee. Our round was three hours and fifteen minutes from the Yellow tees, with both my playing partner and I playing really well and posting scores in the 80s despite the cool, forceful, constant wind. Perhaps due to the subtly of the fairway humps and bumps, I found the course is less visually intimidating than a more typical Dye-designed course. Perhaps that is why I enjoyed the course so much, as did The Wife, who rode along to enjoy the incredible landscape and horizon. One of the subtly evil Dye design features at the Wolf is that the tee boxes never really point at the target portion of the fairway, like here at the 17th. 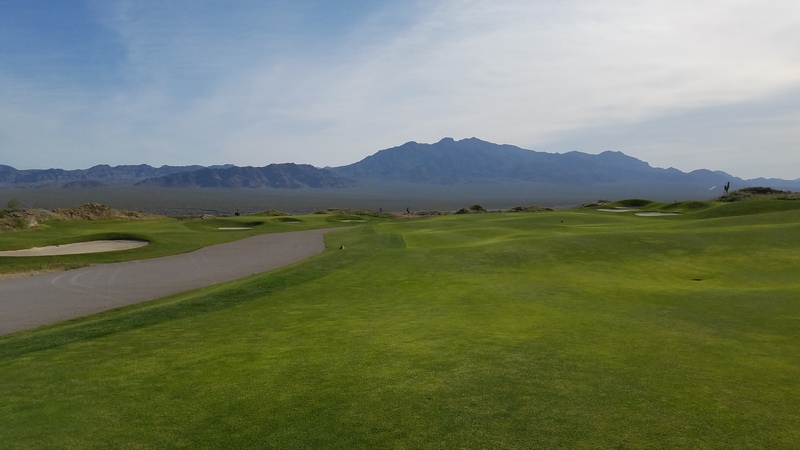 Though an appreciably more expensive green fee than either Sun Mountain or Snow Mountain, after playing the course I concluded that the Wolf Course is worth its more exalted reputation and the extra cost. 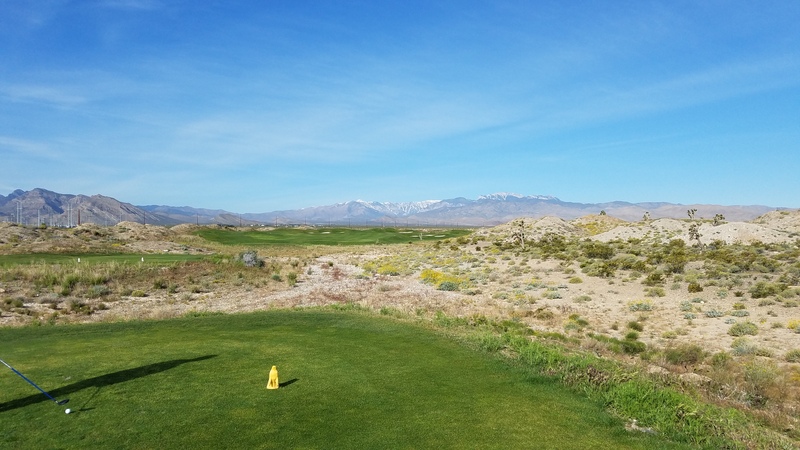 When you combine the playing experience with the incredible visual setting, the serenity of the escape from Las Vegas’s Strip, and the perpetually warm and welcoming customer service experience, I rate the Wolf as one of my favorite overall golf experiences. Admittedly, it’s perhaps not as well-known or highly regarded as Shadow Creek or Cascata. There are flashier, more quintessentially “Vegas” experiences closer to The Strip, like Bali Hai and TPC Las Vegas. Nonetheless, I struggle to imagine I would have actually enjoyed those experiences more than I enjoyed the Wolf Course. A view of the protected 18th green from the fairway at the Wolf. 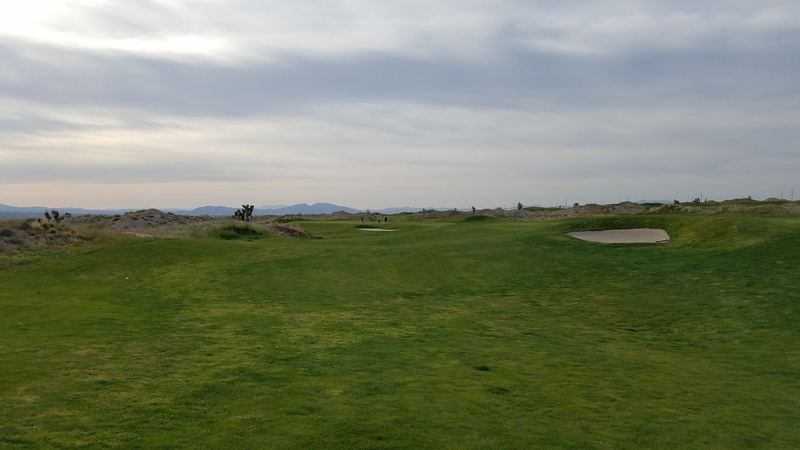 A links style course in the desert could come off as a bit of a contrivance, but the Wolf does not disappoint, striking a great balance of fun, challenge, and individual shot values. 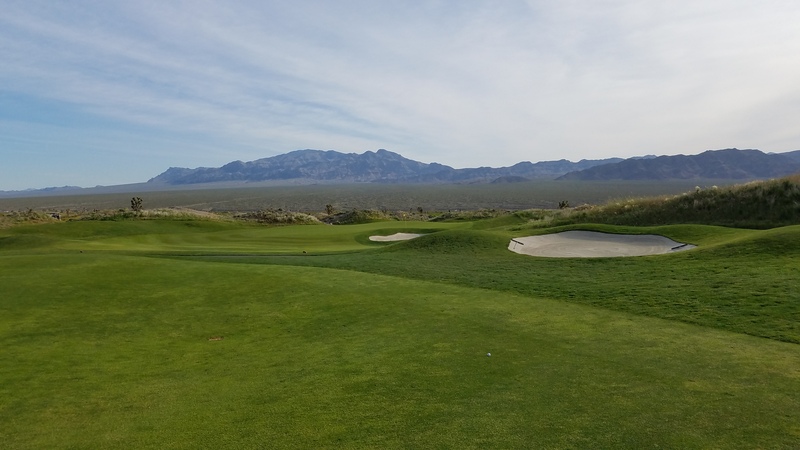 It is definitely the most challenging of the three Paiute courses, and should I ever find myself in Sin City again, I would definitely consider circling back to play it again. 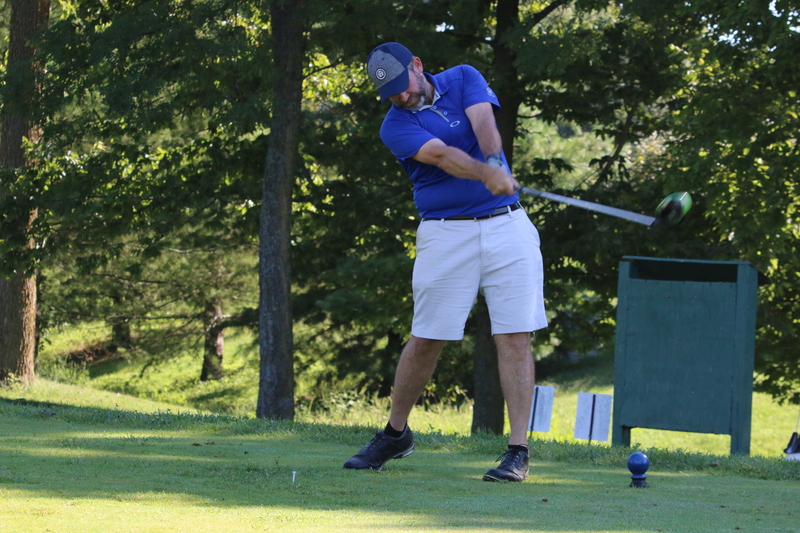 ← May Poll Question: What’s your golf sock game like?